Religious freedom is at risk in Sweden, where the government is trying to force Chabad emissaries to send their children to public school. Chabad-Lubavitch emissaries to Sweden have been threatened by the city of Gothenburg with thousands of dollars in fines for home schooling their children, as the Swedish government attempts to force this Jewish family to send its children to public school. According to the notice, four of their children who currently study at an international online school must be delivered to a Swedish school by today (Wednesday). Failure to do so could result in a fine of 16000 crown - the equivalent of $2,400 -- per week. The children's education is not lacking by any means -- and they are not the first in the family to have been educated at home. Six of the family's 11 children also learned at home in their early years, and now live and study abroad at Jewish high schools, teaching seminaries and rabbinic colleges. All are pursuing careers in education. In addition to the international online school attended by the children -- and 500 of their classmates around the world -- the Namdar children are also receiving private tutoring. Their secular curriculum includes English, Swedish, mathematics, geography, science, music, art and gymnastics. All the children are fluent in English, Swedish and Yiddish, and can read Hebrew by age 5. The notice came following a change on January first in Sweden's law that tightened restrictions on home schooling. The amendment permits home schooling only in "extraordinary" circumstances -- and religious issues are explicitly excluded as a valid reason for home schooling one's child. Sweden does not tolerate differences very well, notes Leah Namdar. The longtime ban on shechita (Jewish ritual preparation of kosher meat), and recent laws tightening restrictions on Jewish ritual circumcision are warnings of what Leah Namdar said could become "the last battle against Communism." "We're two parents fighting city hall for the right to give our children a Jewish education," she told Lubavitch.com. The family's lawyer agrees: the Gothenburg v. Namdar case will be a critical test of Sweden's record on religious freedom, said attorney Richard Backenroth. The lawyer has been careful not to attribute the city's action to anti-Semitism. However, European Jewish Congress president Dr. Moshe Kantor recently noted that Sweden is the only nation within the European Union unwilling to discuss domestic anti-Semitism with the EJC. Anti-Semitism has risen in Sweden in recent years, along with a trend towards the extreme right. 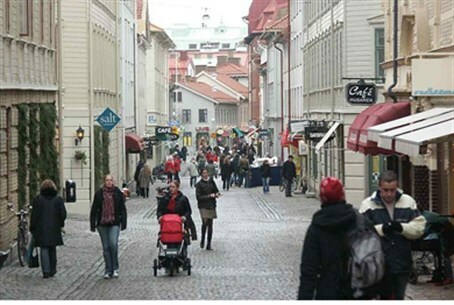 Jews in the city of Malmo in particular have begun to flee the community as a result of the rising trends. Backenroth, who is appealing the notice and the "exorbitant fine" that arrived while the case is still pending, told Lubavitch.com, "Sweden's schools cannot possibly accommodate the needs of the Namdar children with respect to their religious requirements." More ominously, forcing the Namdar children -- the only Orthodox Jews in the city -- to attend a Swedish school, could expose them to real danger, the movement warned. Swedish schools are notorious for their bullying problems and the children would become a certain target for anti-Semitic harassment. Guy Linderman, a Jewish citizen of Sweden, agrees the Namdar children need not attend Swedish schools. Active in politics while living in Sala, he told Lubavitch.com he had originally supported the new law when it was drafted years ago, but believes it should not be applied to the Namdars. The law, he said, was intended to ensure that Sweden's immigrant population was education, "many of who... had grown up illiterate, incapable of signing their names." The Namdar children, who he knows well, "are more educated than their Swedish peers," Linderman said. "This is a stain on the reputation of a country that takes pride in equality as a fundamental value," said Rabbi Namdar. Both he and his wife said they regard education as their "highest priority."